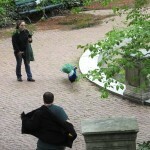 Two peacocks walked and flew around Brooklyn’s Prospect Park and Botanic Garden after escaping from the zoo. The naughty birds had just been given free range of the zoo and took their freedom a little too far. GQ and Esquire face off over the exotic predator release in OH. Esquire goes all action adventure. GQ tries to figure out how lion, tigers and bears were unleashed on suburbia. 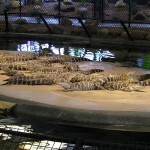 South of the Border now lures I-95 travelers with a roadside reptile lagoon full of alligators, turtles and snakes and endangered crocs. 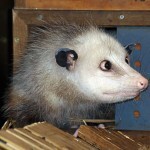 Heidi the cross-eyed possum was orphaned, probably by a car, then raised at the NC Zoo in Asheboro before heading to 3 European zoos and fame. Heidi, who was orphaned in NC and hand-raised, became a celebrity in Germany. She was fat and ultimately arthritis did her in. Mexican wolves get good news, but is it enough to turn the species around? Mexican wolf numbers are up slightly, the FWS actually released two and a new management is in the works. But is it enough to save this stalled species rescue? Keep reading Mexican wolves get good news, but is it enough to turn the species around? Nova Scotia is going back to barbaric bounties, offering trappers $20 per coyote pelt. They hope to kill 4,000 that way. 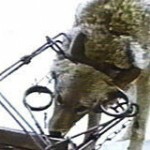 Finland wolves and ND coyotes also under attack from poachers and snowmobiles. 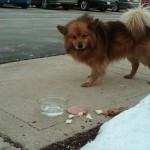 Dozens fed and tried to catch Rusty in Oak Brook, IL. After 3 year chase, he’s headed to UT’s Best Friends. What do you get for a fellow despot of an impoverished country? How about a menagerie? Conservation groups are pissed that Zimbabwe is sending North Korea a mini-menagerie–two of every species from Hwange National Park. You can only imagine how a nation that can’t provide food and electricity for its own people will treat elephants and lions from Africa. Actually, you don’t have to imagine. 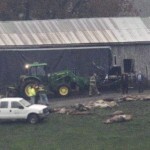 Some news reports make it seem ambiguous where they might go. But there’s only one zoo in North Korea and it’s totally sad, crappy, creepy and unaccredited. Asia Times reports that a bunch of animal fighting films have come out of North Korea and pits animals against each other to fight to the death–just the kind of flick our Supreme Court endorsed. 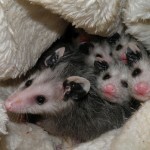 If you’re looking for an animal attraction in central Florida that doesn’t make you feel icky about how they treat the animals, check out Wildlife Rehab of Hernando. Jimmy Jablon started out taking in local native wildlife–raccoons, alligators, fox–but demand for exotic animals turned out of homes and those creepy roadside attractions. Right now Jablon could use the donations, after spending $8,000 for tests and surgery for a 160 pound lion cub that’s now recuperating in his house to ward off infection. Jablon has seen so many of what he calls “photo cubs”–big cats misused to pose for cute pictures when they’re young–that he recognized the syndrome. The cat had been underfed and improperly fed and her skull wasn’t growing to keep up with her brain. Jablon drained more of his savings from working in the insurance business to pay the vet bills, which he had been hoping to get a break on for rescuing the animal.